Lower Woods nature reserve is one of the largest ancient woodlands in the south-west of England. Lower Woods is one of the largest ancient woodlands in the south-west of England and covers three square kilometres. The reserve has 23 woods and coppices whose boundaries have remained unchanged for several centuries. 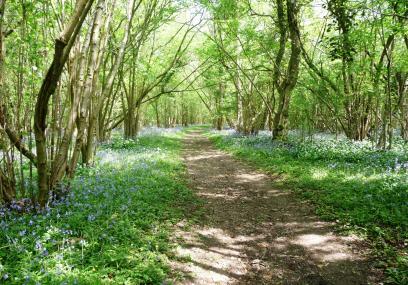 At almost 300 hectares (700 acres), Lower Woods is the largest Gloucestershire Wildlife Trust nature reserve and is jointly managed with Avon Wildlife Trust. It is one of the largest woodlands in the Gloucestershire county. A visit to Lower Woods is to go back in time to what is still a Mediaeval landscape of individual woodlands and coppices surrounded by ancient woodbanks and separated by fingers of grazed Common land and old grassy roads called 'trenches'. between Wickwar and Hawkesbury Upton off Inglestone Common. Paths and steps can be muddy and slippery when wet. Access is slightly up hill, paths can be uneven. There are a number of way-marked walks available with varying degrees of accessibility, but all with some physical barriers. Paths are narrow and with steep cross gradients in some places. Some of the flatter paths around Lower Woods Lodge are accessible for all terrain wheelchairs and pushchairs in the drier months of summer and early autumn. Most visitors park at Lower Woods Lodge accessed down a track opposite the Inglestone Farm Holiday Cottages off from the Wickwar to Hawkesbury Upton road. Informal parking for around 12 vehicles adjacent to Lower Woods Lodge . No designated parking bays.